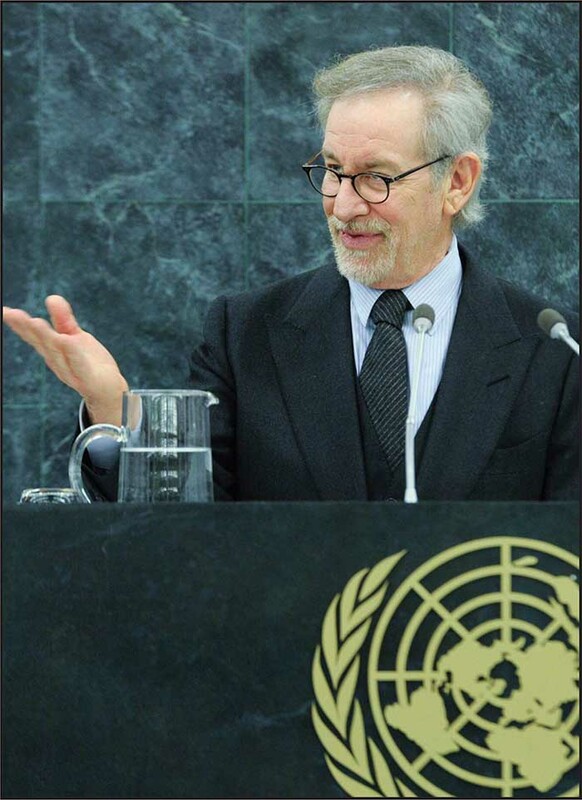 Steven Spielberg, Schindler�s List�s producer, addressing the UN on UN Holocaust Remembrance Day. I'm honored to speak to you on United Nations International Holocaust Commemoration Day. To the Holocaust United Nations Outreach Program, I'm grateful to you for inviting me to address this year's theme, "Journeys Through the Holocaust" - and for years of partnership with the University of Southern California's Shoah Foundation. It's particularly meaningful to me that Rena Finder and other survivors of the Holocaust and genocide are here with us today. I'd like to dedicate my remarks to them. The United Nations is one of the most important institutions that humanity has created, not only because of our shared hope that it will accomplish what's set out in its Charter, but because the UN provides a place where representatives of all the peoples of the world listen to witnesses tell of their experiences, and after listening, policy is made; this is a place where testimony forms the basis of action. When I began to consider what I'd say about this year's theme, "Journeys Through The Holocaust," I was confronted with two questions. The first was whether I could speak meaningfully, since I'm not a Holocaust survivor. I'm a Jewish-American man, born a year after the end of World War II. My initial awareness of what had happened to the Jews of Europe under fascism came from my grandparents telling me horrifying accounts of the fates of relatives and friends. When I was three or four years old, I remember sitting with my grandmother as she taught English to Hungarian survivors; they showed me the concentration camp tattoos on their arms – I've been told what this is when I started to learn to read numbers. Like a lot of Jewish kids, I encountered versions of anti-Semitism growing up, and I examined those encounters in the light of the history I'd absorbed of pogroms and death camps. Anti-Semitism led to the construction of Auschwitz, and while I sensed a connection between bigoted slurs and genocide, I wondered how the American version of anti-Semitism I'd experienced had been rendered so infinitely less destructive. The effort to answer this question shaped my politics, as did learning that, in addition to six million Jewish lives claimed during the Holocaust and the genocide of the Roma, Nazi persecution victimized many other groups such as homosexuals, the disabled, and political dissidents-all vulnerable to prejudice and oppression and the fascist killing machine. I became a filmmaker because it was important to me to communicate my concerns and preoccupations to my audience, and, when I became a father, to my children. It took me approximately twenty years of directing sharks, aliens and dinosaurs before I believed I might be ready to make a film about the Holocaust- and once I'd started directing Schindler's List, I realized that I felt anything but ready for the task at hand. During the filming, survivors of the Holocaust told me their histories. Many said, "Please, tell my story after you tell Oskar Schindler's." They weren't asking to have a movie made about them; they were asking me to help ensure the existence of an indelible record of what had befallen them, their loved ones, their cities, their entire culture, and their civilization. I believed that, given the opportunity, they could become the world's teachers. We needed only to give them the platform. We built that platform when we began the Shoah Foundation in 1994. In the first four years, we travelled around the world, recording approximately 250 interviews with Holocaust survivors each and every week. Rena Finder's journey is recorded in her Shoah Foundation testimony—along with the journeys of 51,413 other survivors, living in 56 countries, speaking in 32 languages. Directing Schindler's List, interviewing survivors: this was my way to try to understand the Holocaust. Breaking down a phenomenon of overwhelming horror into individual moments was the only way I knew how to approach and better understand it. Those who lived through it know what we'll never know; but we can learn, they want to teach us. Survivors and witnesses often say that their dearest hope, the hope that helped keep them alive, was to be heard, and believed and understood. So although have no personal journey through the Holocaust to recount, I offer my journey to the journeys of survivors. My Holocaust journey, and that of everyone not a survivor, is a journey toward understanding. My second question regarding our theme, "Journeys through the Holocaust" pertains to the preposition "through." That word made me pause. In this context, it strikes me as being a tremendously optimistic word; it suggests that it was possible, and remains possible, to enter and then exit the Holocaust, that for those who experienced it, and for the world in which it occurred, there was a beginning and an end. Of course there were both, historically speaking. A small minority of people did survive the camps, and went on to live productive and long lives, extraordinary lives in the course of which many felt they'd decisively triumphed over the evil that tried and failed to devour them. Survivors of horror often express an undaunted, undamaged optimism. There's nothingI know about human beings more marvelous and beautiful than this capacity to transform rage and grief into a wellspring of wisdom, progress and justice. But the survivors' powerful determination to contribute to a future without genocides doesn't come from leaving the Holocaust behind, from escaping history. Their determined demand is that we engage fully with history, that the Holocaust remain with us, in memory. Theirs were journeys into the Holocaust. They cannot emerge from it. And neither can the world until there are no more genocides, until the unthinkable becomes impossible Tragically, we are all aware that the Holocaust is with us today, in ongoing attempts at genocide all around our planet. In response to this reality, we expanded the Shoah Foundation's collection to include testimony from the genocides in Armenia, Cambodia, Rwanda and the Nanjing Massacre and eventually we'll include testimony from Shreber-neet-suh and Sudan. I was recently informed by the Foundation staff that survivors of the Rwandan genocide have asked to see Holocaust survivor testimonies because they want to learn how people rebuilt their lives after facing death and losing loved ones. Victims of genocide in the past are now teachers to victims of recent genocide. When I first heard this, I was deeply moved, and I felt glad that our work gathering memories of the Shoah was helping in this unexpected way. But also I became terribly sad. Why have successive generations after the Holocaust fallen victim to mass murder? If genocide is as unstoppable today as it seemed to be in the 1930's and 1940's, don't we have to ask ourselves why bearing witness matters? Why gather testimony, if genocide persists? At the end of his interview, Holocaust survivor George Papanek looks directly into the camera and urges humanity to come together, despite the risks, to create the momentum we need to act together to stop genocide. It is, as I said, a great accomplishment of our species that testimony like George's can be heard, and is heard, in the high chambers of power. In chambers such as these, survivors tell us that genocide is prepared for, that intervention, once the killing machine is in place, is sometimes successful, but more often it's not. They ask us to learn to anticipate the warning signs and predictors of genocide and insist that mass graves don't have to open up before we act. They ask that we learn from what they suffered. The challenge of genocide is to confront, simultaneously, a literally unimaginable totality. The numbers numb us. They exceed the human mind's capacity to make sense of the world. Here's one way to comprehend how incomprehensible genocide is. If a person wanted to watch every one of the nearly 52,000 testimonies of Holocaust survivors in the Shoah collection, he or she would have to watch testimony 24 hours a day for nearly 15 years to see the Visual History Archive in its entirety. And this Archive, we should remember, is less than one percent of the Holocaust's Jewish victims, less than half of one percent of the total number of victims of the Holocaust. Neuroscientists say we're hard-wired for the concrete reality of small villages, at best - a few thousand people. Hundreds of thousands of people, millions of people are more than we can comprehend. So to confront the reality of genocide is to confront murder in numbers so great that abstraction cannot be avoided, and with abstraction, I fear, comes a diminishment of our compassion, perhaps of our moral imagination. How can we possibly assimilate such quantum evil and then form plans for action? Because we've been spared, we know that despair is a choice, and remembering is a choice, but if we want to remain fully human we have no choice but to confront and remember the past, to learn, and to act on what we've learned. There are no bystanders to history. History doesn't flow around us and past us - it flows through us - or rather, we are history's flow. Every human life is historical, every person is composed of history. History is simply another way of saying human life. When testimony and witness form the basis of policy, when truth, rather than narrow national or local interests, forms the foundation for action, there is great cause to hope for resolution of what appear to be unsolvable problems. That is why the broad perspective the United Nations commands is so critical. This institution, in which so much of the world's hope has been placed, exists in defiance of imponderable difficulties. That the UN exists at all, and has endured, and expanded its mission, is proof against despair; that the UN dedicates itself to bearing witness, and joins its authority to the witness of others, is an unanswerable argument for efforts to remember the past, to learn and to take inspiration in the urgent name of action.